With summer approaching I am really looking forward to serving cold healthy snacks to my daughter and any kids visiting. For the most part because I've got my hands on Ice Pop Joy, an indispensable resource for nutritiously entertaining kids through the warm months (and any other time they ask for an ice pop). Anni Daulter always gets it right with kids nutrition, her book Organically Raised was also a hit with us. I never buy any sort of pre-made frozen treats because most of them are made with ingredients that can hardly be called 'edible'. Even organic ice cream isn't exactly good for you. With this book you can actually make really healthy ice pops with a nutritional punch and instead of feeling guilty you'll be feeling proud giving it to your kids (and the whole family). I honestly had no idea you could do so much with an ice pop! Yogurt and vegetables? Why didn't I think of that? 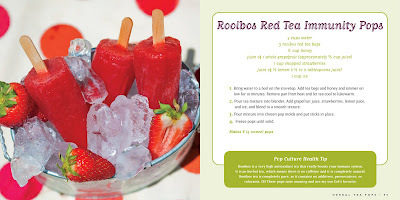 The book is just brimming with recipes I can't wait to try once I officially get our ice pop maker. For now I really wanted to test at least one recipe even without the tools I needed. I decided to make the Goo Goo Ga Ga pop from page 65, I had the ingredients on hand. Apples, mango chunks, and Greek yogurt sound like a heavenly combination! I substituted the Greek yogurt with plain whole fat organic yogurt I had. I put the puree into plastic tumblers, the only thing I had on hand to make sort of an ice pop and I stuck gelato spoons in it once it froze half way. Really quick and easy to make! After dinner we ate it so fast I forgot to snap a photo of my toddler thoroughly enjoying it. My husband loved it too, not to mention myself! I know what we'll be snacking on when warm weather rolls around. I also can't wait to try the Green Machine ice pop with spinach and the Peace Pop with carrots. and investing in healthy snacking and dessert! 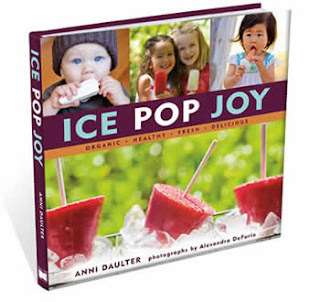 Two Eco-Babyz readers will be blessed with an Ice Pop Joy recipe book of your own! Mandatory Entry: Follow Eco-Babyz with GFC (blogger) AND visit Anni Daulter's website and tell us what about conscious family living speaks to you most (explore categories on the right). Contest ends at 11:59 pm on Thursday, April 21th, 2011. Winner will be selected using Random.org and contacted via email. Open to US residents 18+. I follow you and I like the natural parenting section of the site. I follow Eco-Babyz with GFC! The organic shopping tips like shopping locally and setting a good example for my children really spoke to me! I voted on Top Baby Blogs! Hi! I follow you on GFC and I love most the idea of conscious cooking and thinking about your food! As a vegetarian, I think about my food choices everyday. As a new breastfeeding mom, I'm even more careful knowing that my baby is eating what I am. Food should be sacred, and I appreciate that idea. I'm a member of the community! 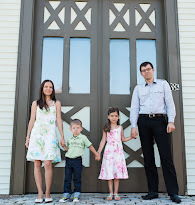 I rated your blog at Top Mommy Blogs! GFC follower and I love the organics and recipes section. About shopping for organic foods! I love her mantra “Every meal prepared in this kitchen will be done with love, joy, and the intention of feeding my family in body, mind, and spirit.” This reminds me of my dad's prayer at our meal "Bless this food to our use."